Data management is crucial to career—and resume—success. 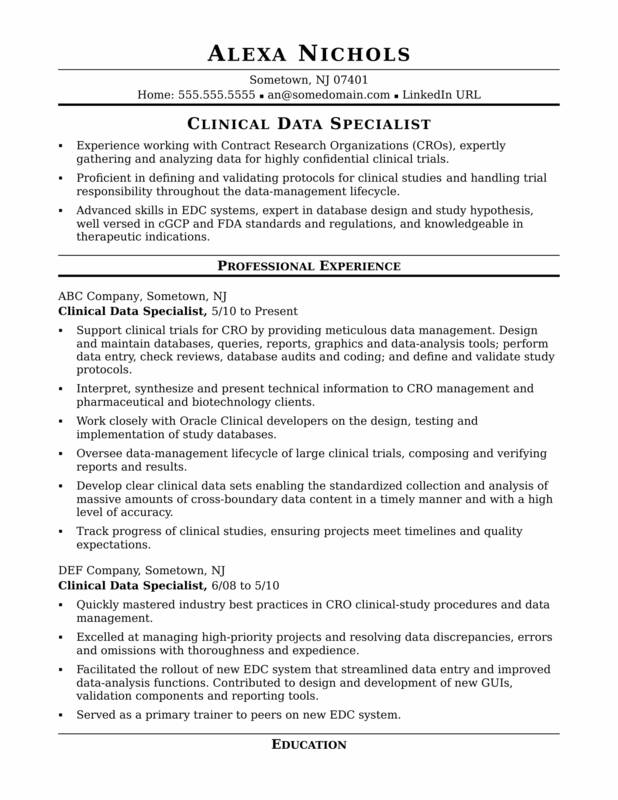 This clinical data specialist resume shows the right amount of information to highlight. The ability to manage a large volume of data is crucial to success as a clinical data specialist. When it comes to your resume, it's equally important to control the amount of information you provide and to highlight the key points, says resume expert Kim Isaacs. To see how, view this resume sample for a midlevel clinical data specialist that Isaacs created below, and download the midlevel clinical data specialist resume template in Word. And if you need more help, let the experts at Monster's Resume Writing Service create a high-impact resume for you that will impress employers. Jobs for medical and health service managers are projected to grow by 20% (or 72,100 jobs) from 2016 through 2026, which is much faster than average, according to the Bureau of Labor Statistics (BLS). You'll find the highest level of employment for this job in the following states: California, New York, Texas, Ohio, and Pennsylvania; and in the following metropolitan areas: New York City, Los Angeles, Chicago, Boston, and Houston. In terms of salaries, you can expect to earn a median wage of $98,350 per year, or $47.29 per hour, according to the BLS. Additionally, you can learn more about biotechnology careers and search for clinical data specialist jobs on Monster. Four years of experience working with Contract Research Organizations (CROs), expertly gathering and analyzing data for highly confidential clinical trials. Proficient in defining and validating protocols for clinical studies and handling trial responsibility throughout the data-management lifecycle. Advanced skills in EDC systems, expert in database design and study hypothesis, well-versed in cGCP and FDA standards and regulations, and knowledgeable in therapeutic indications. Support clinical trials for CRO by providing meticulous data management. Design and maintain databases, queries, reports, graphics and data-analysis tools; perform data entry, check reviews, database audits and coding; and define and validate study protocols. Interpret, synthesize and present technical information to CRO management and pharmaceutical and biotechnology clients. Work closely with Oracle Clinical developers on the design, testing and implementation of study databases. Oversee data-management lifecycle of large clinical trials, composing and verifying reports and results. Develop clear clinical data sets enabling the standardized collection and analysis of massive amounts of cross-boundary data content in a timely manner and with a high level of accuracy. Track progress of clinical studies, ensuring projects meet timelines and quality expectations. Quickly mastered industry best practices in CRO clinical-study procedures and data management. Excelled in managing high-priority projects and resolving data discrepancies, errors and omissions with thoroughness and expedience. Facilitated the rollout of new EDC system that streamlined data entry and improved data-analysis functions. Contributed to design and development of new GUIs, validation components and reporting tools. Served as a primary trainer to peers on new EDC system.